Music is in the air and SXSW has Austinites seeking to catch as many live shows as possible. In the midst of this music festival atmosphere, PorchFire Records decided to put on their own show and get in the holiday spirit. 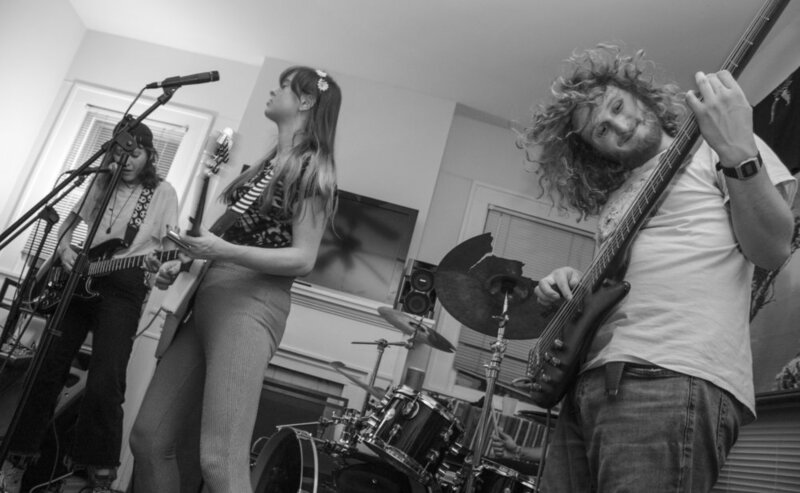 Sitting at Leon and 22 ½ St. in a quaint, seafoam green house resides PorchFire Records, an independent record company that supports and aids local bands through multimedia, music production and live performances. 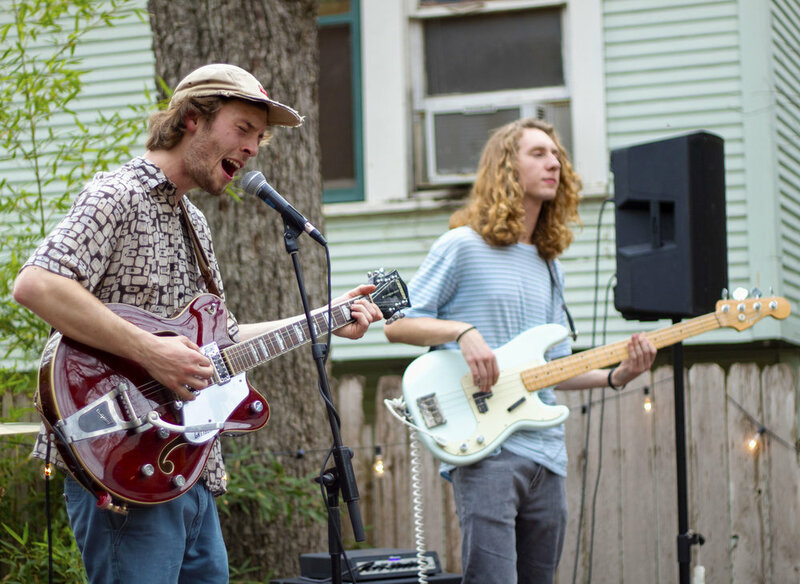 On March 10, it was the setting for the PorchFire Fest in which twelve unique Austin bands got the opportunity to play in front of their friends, colleagues and those curious fans who found out about the event on Facebook. To kick off the day, indie boogie band Pixie Jean performed on the outdoor, wooden stage in the dirt backyard of the house. Towards the back of the yard, there were paintings for sale and a large canvas cloth that read “Paint on me :).” The creative setup was accompanied by brushes and paint on the side for creative fans. Lauren Gold, Arizona State University student, spends her spring break at PorchFire Fest blowing bubbles with red shades and a matching jacket. Emily Svahn, UT public relations major, paints an orange and a banana on the outdoor canvas. Nine Blind Men and The Tiger jam on the outdoor stage. Cosmic Chaos started with the first indoor set and gave an interactive performance for their audience. Immediately after Cosmic Chaos, fans began to pour in and the next outdoor set started. “Howdy doo-dee,” Hayden Havard of The Irons said as they began their set at around 4:15 p.m. in the backyard. A light drizzle fell, but it did not hinder an excellent, yet casual performance by The Irons. Havard tossed a frisbee with the fans while they played most of their popular songs such as “New to the City” and “She’s Out There.” Halfway through the set, they decided to play an unreleased song and announced a soon-to-come album with PorchFire Records, which was met with cheers and applause. To end the set, the band played an instrumental as Havard invited members of the crowd to come up on stage and spit a freestyle. Fan interaction was very high at this event, and as more people showed up, the energy picked up with each performance. As the day went on, bands such as Mary Jane & The Fondas and Indoor Creature kept the fans engaged on both stages. Most of the art, which were depictions of each of the bands, was gone by the time the outdoor performances ended. The crammed group of sweaty fans only grew in energy and excitement as they bounced up and down in the stuffy backroom and middle room. Big Wy ushered in their first song with three trombone players clearing a path from the backyard, the kitchen and into the house’s backroom. The chatting audience quieted and turned their heads immediately. To end the set, the band invited the saxophone player from Indoor Creature to join them in finishing their set, and he played a stellar solo. 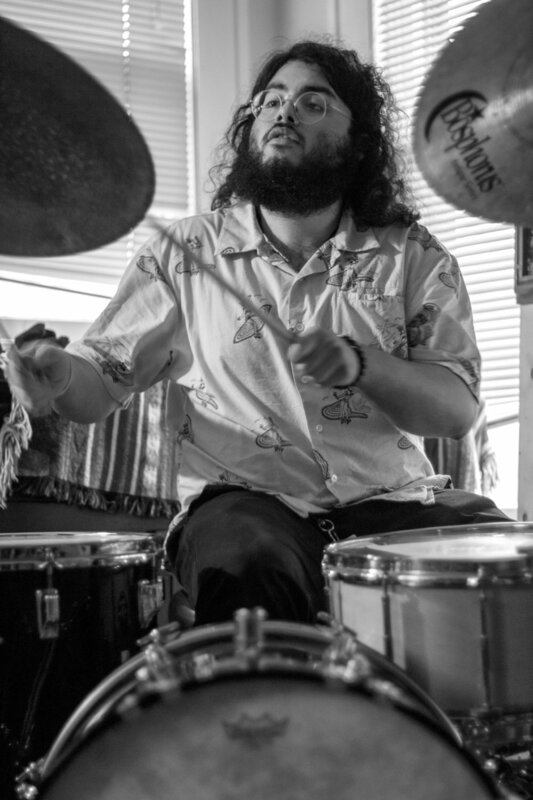 Drummer Brandon Medellin plays with HYAH! on PorchFire's indoor stage. Ally Brown, lead vocalist of Merry Jane & The Fondas, starts her performance by shouting into the mic. Bassist John Young of Merry Jane & The Fondas whips his curls back. The crowd dances at the indoor set of Merry Jane & The Fondas. The headliner, pop-dance group TC Superstar, closed the music-filled day with the eyes of everyone on them. Their group consists of a keyboard player, guitarists, two dancers and a lead singer. After playing their well-known songs such as, “I Don’t Mind” and “Toyota Corolla,” they had to cut their set short due to a noise complaint from surrounding residents. “One more song!” the crowd chanted as they had to wrap up their performance. PorchFire Fest was successful in gathering some of Austin’s most eager local music lovers and providing an enjoyable setting. As the last few outdoor sets finished, they provided ribs, chicken tacos and veggie kebabs to the attendees for affordable prices. So with food, art and music, there wasn’t much more a fan could ask for a $5 entry price.